Is Milk Kosher in Melbourne? A number of years ago, while listening to one of R’ Schachter’s Shiurim, I came away with the distinct impression that he had a serious issue in regards the Kashrus of any Milk in the USA because of the prevalence of Halachically damaged milk cows aka Treyf cows. I discussed the issue with Rabbi Mordechai Gutnick of Kosher Australia and he advised me that the veterinary procedures extant in the USA were not germane here in the same way on account of the different feeding practices which obviated the potentially Treyf inducing condition common in the USA. I also asked Rabbi Tzvi Telsner Dayan of of the Chabad Yeshivah Shule in Melbourne whether in light of Rav Schachter’s views, there was a problem with Chalav Yisrael in the USA. Rabbi Telsner claimed that the conditions in Chalav Yisrael production in the USA were much better than the general USA dairy industry and did not have this problem. “אמנם המצב אינו פשוט כל כך, שהרי אף אם אין חשש עירוב חלב בהמה טמאה, יש חשש לעירוב חלב אסור מבהמות טריפות, וייתכן שעובדה זו משנה את התמונה. I haven’t (and won’t) have a chance to read the T’chumin article any time soon so perhaps you can elobrate for those of us who are less knowledgeable. I (ignorantly?) would have thought that since the significant majority of cows are not Treifot, that we can rely on the individual Chezkat Kashrut of each cow’s milk that goes into the vat (even if statistically we know that a certain proportion of animals will invariably be Treifot). Presumably this Tzad Lehakel is additive to the concept of Bittul which would also apply (albeit Bedieved)? Similarly, my layperson’s understanding is that this is the same Halachic basis for the fact that even though there are a plethora of potential physical causes of Treifot, when it comes to Shechita, we don’t check for every possible defect with every animal because we can rely on the individual Chezkat Kashrut that applies to each animal. Perhaps one should ask Harav Schachter about the conditions for Cholov Yisroel in the USA. Is the milking , storage, transport, processing etc done inte same way as Cholov Setam? My understanding is that R’ Belsky disagrees with R’ Schachter on the general issue and is loathe to prohibit Milk products. R’ Schachter does not impose his will on anyone, and from his perspective, I am pretty sure he is okay that the OU relies on R’ Belsky here. Privately, and when asked, he gives his personal opinion. Now, I know I have read R’ Belsky’s view. I gave the Sefer with his recent Psakim to R’ Telsner, so I can’t check 🙂 That being said, one suspects that others like the OK and Star K need to deal with this issue as well. The writer of the article writes at the end that cholov yisrael is no different. I think he is wrong. At all reputable hashgochos, it is the mashgiach’s job to make sure these cows are removed from milking. 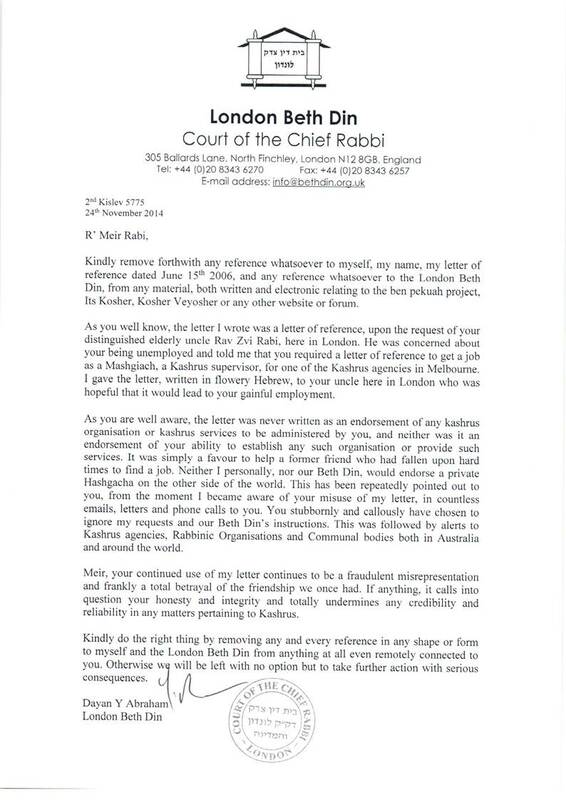 Rabbi Weitman’s comment(brought by Dovid Segal) is more accurate. He is only saying it on unsupervised milk(chalav nochri-headline). So you are claiming that ‘reliable’ chalav Yisrael hashgochas also supervise the feeding and veterinary practices so that adhesions are a miut sheino motzuy. Maybe. On what basis do you make this claim? Which chalav Yisrael in the USA is known to be reliable and which ones assume the age old tradition of simply ensuring all milk is from cows? As R Weitman says, the issue is operations, which make a hole in the inner stomach. This is definitely checked by the Kashrus orgs and mashgiach. It’s apparently worse in the US, where the feed makes many cows bloat and they make a whole in the stomach to get the bloating down. Again, reputable orgs make sure that these are not milked for cy. With adhesions, these are stam behemos are Kosher, especially that lesions are not treife, although by Shechita we are Machmir. I will have to look up in Shulchan Aruch, but I am almost sure the Remah talks about such lung treifes in milking and he says it’s ok because of bitul. Obviously bitul berov. I’m not sure why you are so sure that each cow that has a procedure is first checked by a Mashgiach. How do you know this? It seems to me that this could only happen in a small specialised farm. Note that these seem to be disappearing. Does the Mashgiach then mark each cow that has had this common procedure and then check to see that only unmarked cows are used to produce milk? I’m not saying this doesn’t happen for certain Chalav Yisrael in the States, but does it happen for all? Were procedures changed over the years? Once the Mashgiach could snooze in a corner and simply ensure no camels or horses etc were milked. Now, in some countries, it seems like a full on job including interaction with veterinary surgeons. My understanding is that a fundamental part of running a dairy is tracking the health and milk production of your cows. I would suppose that identifying cows that had had this operation is a trivial matter; you would just pull the records and check. Being a city slicker, are cows that are not sick (and this is not considered a sick cow by western standards, and is a routine procedure) be identifiable via some label? Does a Mashgiach have to check the labels of each cow before they are milked? The mind boggles! Cows aren’t machines. You need to know how old they are, when they were last bred, vechulu. You need to track their milk production so that they can be “retired” when they are no longer producing enough milk. Here’s a link to a very advanced milking system that uses transponders and computers to keep track of milk levels, but back in the day it was all done on paper. As for the mashgichim, I suppose that if this operation is a genuine concern then they would instruct the farmer to separate any cows that had had this operation, or find an alternative. I can’t imagine that it would be necessary to do it at every milking once a chazaka had been established. Are we going to see “Glatt” Chalav Yisrael soon in the USA, which doesn’t rely on a Miut and Mirtas? n there is no dovor tamei be’edro, the mashgiach can sit beside the refes and not even need to see the milking if he is sitting(maybe different Halocho in China, if dogs running around farm:-)). He must see the tank empty and clean before the start and be there at begining of milking. These days many hashgochos have 1 mashgiach roving around several farms in close proximity, even the most mehadrin orgs, as long as the mashgiach was there at the begining and checked the tanks. Correct. All big farms are computerised and all procedures must be recorded by law. The mashgiach just looks up the computer and makes sure that any problematic cows are not milked. A cow that has a procedure done, by law its milk is not permitted for human consumption, due to antibiotics given(until it’s out of the system). So once the mashgiach knows this, he can record it personally that this cow never gets milked for Kosher. On small farms it must be recorded in writing. I heard from a former Adass/Tempo mashgiach that he sometimes had contact with the veterinary surgeon who does the procedures. not the only you don’t know what the Chalav Yisrael Mashgichim do, the Mashgichim themselves don’t know what they do. Been there and seen it all. “In those days they didn’t have or were not aware of these type of treif issues”. in our days as in the old days you still can’t check the cowes, and you have to relay on computer evidence. do farmers have by law to record that a cow had an operation? are farmers not allowed to milk cows that had an operation? Indeed. My information on the weekend, especially in the USA is that once a cow has had a procedure, and is now deemed healthy by Health standards, they are re-introduced. Will the Mashgiach really know? He knows by looking on the computer. Also, the cows are numbered(usually ear tagged) as they are on the computer. Even after it rejoins the milking, the recording stays. In addition, mashgichim record for themselves which cows had procedures. It’s quite simple. As I said, the Rabbi I spoke to knows Kashrus inside out and those were his comments about the USA situation. Yes, by law they must be recorded. When they have procedures, they are treated with antibiotics, which are not allowed in milk for human consumption. Once the antibiotics are out of the system and the cow is healthy, it is reintroduced into the milking. Next Next post: A new challenge to Reform?